Based on the hardware / tools / processing power onboard I assume i should be fairly easy to setup a JaSager access points (one that claims to be all SSID's) and do a MitM trough (for example ettercap) in order to replace a image (or something like that, and root clients connected). that actually sounds like a very nice combination. You'll have the appliance type pinapple and the nethunter companion device. pinapple could pass off shells to your tablet or both could pass off shells to your desktop kali. I use it with Kali 1.0.9 on my RasperryPi. FruityWifi is probably a better choice then pineapple since pineapple is built around openwrt. Yep! I have two Pineapples here and they are good. But not that flexible like FruitWify on my Pi or the Nethunter itself. Hi guys, I was managed to install fruityWifi on my nethunter nexus5. 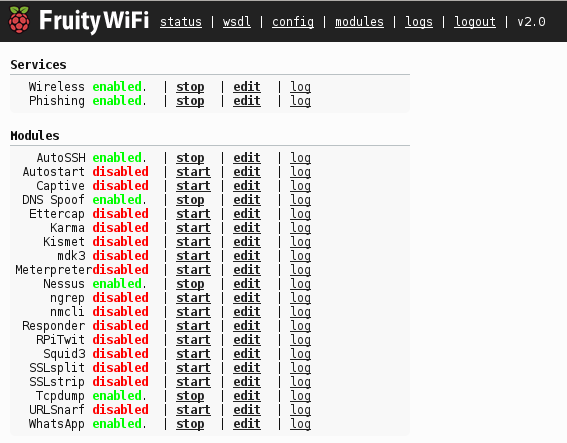 And I was get in to the webUI of FruityWifi. Last edited by zerone.v01d; 2014-10-24 at 04:03. You can try to download the packages from github with your client and copy them to the nethuner chroot. If i have some freetime i will try the same and see where the problem is. Need a little help with Kali Linux functions.